There are plenty of magazines and websites which would offer a view on which of these two cameras was the 'better', assigning slightly arbitrary numbers to different features to end up with a measure of excellence that has no real relevance. We would not lower ourselves to such base thoughts and in any case it is almost inconceivable that a professional would jump ship for the sake of an extra stop in the murky world of 200,000 ISO or a couple for frames per second beyond an already rapid 10 fps. All this does not prevent the teasing which goes on between devotees of the two camps and if it makes them strive to do better then it is all to the good. 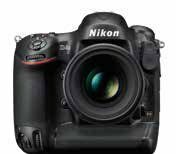 On a more serious note, the Canon 1Dx was launched in October 2011 and so the Nikon D4s is almost three years its junior. Technology in cameras tends to move in phase across the marques (often because the underlying components are the same) but sometimes the early adopters suffer from unforeseen problems. The fact that Domenic Aquilina and Ian Cook sat yards apart at the European League Cup Final and were each using the subject cameras only served to add an edge to any comparison. In the event it could be argued that the difference in position (pitch side) influenced the amount of cropping needed and that had more influence than other things. Ian Cook also took the D4s to the London Triathlon which gave additional material and Jon Ashton waded in with recent experience shooting nature subjects on the Canon. Both cameras are the flagships of their brand, essentially top-end, robust and fast professional cameras intended for serious work and with high price tags. Each carries the hall marks of a press camera: very fast motor drives, high burst depth, fast in-camera image processing, high ISO capability, metal bodies and full weather sealing. Each, of course, is backed by a vast array of lenses and accessories for every conceivable assignment. One feature which crops up time and time again is the focussing speed and accuracy. The faster on-board computing power has made faster framing rates possible while deepening the burst depth and, in the case of the D4s allowing huge numbers of Raw files to be captured. Even so this capability is spurned by many sports photographers who stay on JPEG because it gives them all that they need for the job in hand. This focus ability is critical, there is no point in having low-noise, high ISO and high framing rate if all it does is create greater numbers of fuzzy images. As explained in the following piece Canon have worked hard on their algorithms for focusing, resulting in a rather large set of instructions.